Tom Palazzolo is an American documentary filmmaker who has been making short films since the late 1960s. Based in Chicago, all of his films are about the people and places in and around the Windy City. He is also a fine painter and studied at the School of the Art Institute of Chicago. You can learn more about this filmmaker at his official website. Beginning in the early 1960s, one of the main venues where audiences could watch underground films outside of New York City was the midnight movie screening series called Underground Cinema 12. The National Film Preservation Foundation and The Film Foundation have awarded their annual Avant-Garde Masters Grants for 2012, which will save films by Mike Kuchar, Ian Hugo, Jud Yalkut and more. Jan. 29: Meditative contemplation gives way to barbaric chaos in this selection of classic avant-garde films by Tom Palazzolo and more. I’ve uncovered the lineup of the first ever Chicago Underground Film Festival, held back in 1994 and which had a very transgressive bent. 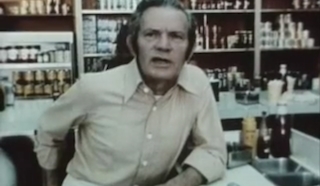 Watch the nine-minute short documentary “Jerry’s” by Tom Palazzolo, about Chicago’s angriest deli owner. The film comes recommended by Roger Ebert. Notable underground film events of 1977 were John Waters directing Desperate Living and David Lynch making Eraserhead, plus Ric Shore’s brilliant Punking Out. Notable underground film events of 1976 were the publication of A History of American Avant-Garde Cinema and the production of Jonas Mekas’ Lost, Lost, Lost. Notable underground film events of 1973 were P. Adams Sitney publishing Visionary Film, John Waters made Female Trouble and David Lynch directed The Amputee. Notable underground film events for 1973 were a widespread appreciation for Stan Brakhage developed; Alejandro Jodorowsky made The Holy Mountain and more. © 2019 Underground Film Journal.